First, I just have to say that the blog post ideas are certainly piling up while I do these giveaways, so I guess that's a good thing. We've had lost teeth, burned fingers, and deep thoughts, oh my! in the Trenches! So I can't wait to tell you allllll about it. Eleven pipers piping different ring tones! Heh. 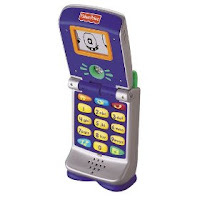 From Fisher Price, it's the Fun-2-Learn Cell Phone! Because what infant/todder/preschooler these days doesn't need a phone of their very own?! Hello? It's almost 2010 - get hip and with it, Momma! You don't want your child to be the only one on the block without one now, do you? Anyway, simply leave a comment below for a chance to win this cute little toy that my poor child was deprived the pleasure of owning! And stay tuned tomorrow because I saved the biggest and the best giveaway for last! Oh yeah. My granddaughter would love that phone. She is always trying to play with mine! My neice would have a blast with it....that is, if my kids don't steal it from her! Now this just screams daycare kids!! Cool, cool! Your find just might be my gain!! OK, I don't have a need for the cell phone, Finn has one already... but I have to tell you the story about becoming your mom cracks me up. At least you're giving someone else the chance to love it! My two year old would LOVE this, and maybe I would get my cell phone back! That is cute. I lose stuff I meant to give as gifts all. the. time! I laughed when I read your post! My mothere did the same thing. She would lose presents, forget that she had them, and find them a year or teo later. Now it happens to me! I would love to give to my niece. Thanks! My babies would think that phone was great fun. Hope we win!